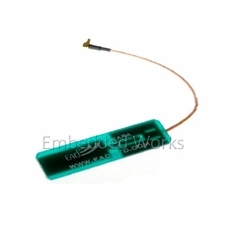 The Acara is a internal 1/2 wave element PCB antenna covering the 2.4 and 5.2Ghz 802.11 (WiFi) frequency bands. It is a ground plane independent design suitable for either mobile or fixed applications. The antenna is available in various cable lengths. This is the 150mm cable version.